Dillingham's Bryce Edgmon on the upcoming legislative session, a local farmer goes hydroponic, Christmas bird results from around the region, and a preview of the 2016 Kusko 300 sled dog race. Butter lettuce grows inside a 40-foot shipping container like the one Belleque Family Farms will have installed in Dillingham this spring. Join us Fridays for Bristol Bay and Beyond, our weekly news magazine on KDLG. The show airs at 12 pm and 6:30 pm on AM 670, and at 8:30 pm on 89.9 FM. Coming up this week... Alaska’s legislature will gavel back into session next Tuesday. As the price of oil continues to drop, and the budget deficit grows, many are expecting these next three months to serve as uniquely important chapter in Alaska’s history. Will lawmakers attempt to cut our way out of the deficit, or seek out new revenue sources? We'll have a conversation with Bryce Edgmon before he heads to Juneau for the start of the session next week. Belleque says a hydroponic grow unit like this should arrive on the first barge of the spring. Craving fresh (like, really fresh) romaine or bok choy this winter? You're out of luck for now, but next winter Dillingham entrepreneur Kyle Belleque hopes to be growing lettuce inside a shipping container. An investment from the Bristol Bay Development Fund is helping Belleque launch his small business with a hydroponic grow system - learn more in this segment. And Bethel’s abuzz as 25+ mushers and their teams prepare for a slightly icy Kuskokwim 300 race and its sister races, the Bogus Creek 150 and the Akiak Dash. We'll hear from Angela Denning, a veteran of the K300 as both musher and reporter, on the trail conditions and competitors to watch. You can follow KYUK's ongoing coverage of the race online. 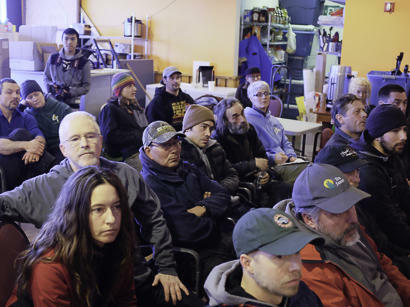 Mushers, handlers and organizers attend the Kuskokwim 300 Musher’s Hall meeting, January 14. These stories, as well as a recap of the week's news, on this Bristol Bay and Beyond for January 15, 2016. That's it for this week's Bristol Bay and Beyond, our weekly newsmagazine on KDLG. We hope you join us each Friday at 12 p.m. and 6:30 p.m. on AM670, and at 8:30pm on 89.9 FM. What did you think of the show? Send comments, suggestions, and other feedback to news@kdlg.org ordave@kdlg.org. Have you taken a stellar photo this week that should be our cover photo? Send it to us!